The best travel experiences often arrive when you least expect them. The same goes for meeting new people and making friends. We had a wonderful time with Lucinda – so happy we were able to meet up! Another one of the MASSIVELY HUGE cruise ships that visit Sydney sits off in the background – there is a new one every day. I have always had great experiences meeting my readers, and yesterday’s meet-up with reader Lucinda was no exception. What Brett and I thought would be just a nice lunch and a long chat with a Sydney reader of the blog turned out to be a day of exploration for us in an area of Sydney we might not have visited otherwise, or if we had, we wouldn’t have appreciated anywhere near as much for its history, culture, and sense of place in modern Sydney. Lucinda has a deep knowledge and understanding of The Rocks neighborhood’s history, its current incarnation, and its future direction. Plus, talking with her was like catching up with an old friend you hadn’t seen in a long while, and we never ran out of things to talk about the entire time. The whole experience took the day from being merely a good one into one of the best days we’ve spent during our travels. 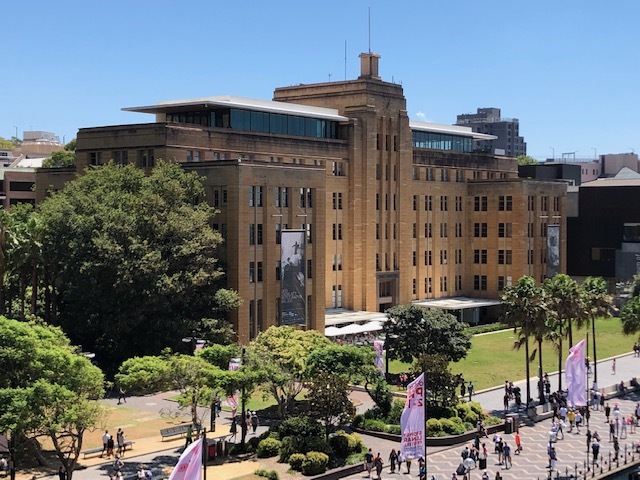 Currently the Museum of Modern Art Australia, this gorgeous art deco building formerly housed the Maritime Services Board. Pilots and harbor masters worked in the upper glass spaces, directing ship traffic throughout the harbor. The Rocks neighborhood sits down under the south end of the Sydney Harbor Bridge. One of Sydney’s earliest settlements (1788), the area came to be where Sydney’s great shipping wharves were located, and the neighborhood was filled with men and families that worked on the docks or the merchant service, something Australia sadly no longer has (all merchant activity is now contracted out to other countries, and Sydney Harbor is almost purely used for recreation now). Along with the sandstone houses that gave the area its name, The Rocks was filled with hotels, pubs, and other related businesses, and was known as quite the rowdy part of town. These days, many pubs remain as a reminder of The Rocks past life, several of them claiming to be “Sydney’s oldest pub.” Other buildings related to The Rocks’ maritime past have been converted to other uses, and most sad of all, homes that workers’ families had lived in for generations have been and are being converted into million-dollar residences – gentrification in full force – while the families who formerly lived in those homes were moved out to the far west side of Sydney, away from the harbor and neighborhood they had lived by and in for so long. 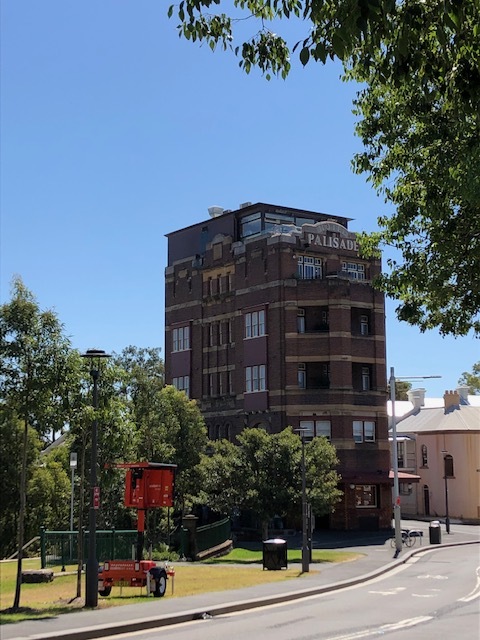 The former funky Palisade Hotel has become a chic boutique hotel with a fancy restaurant and pub. 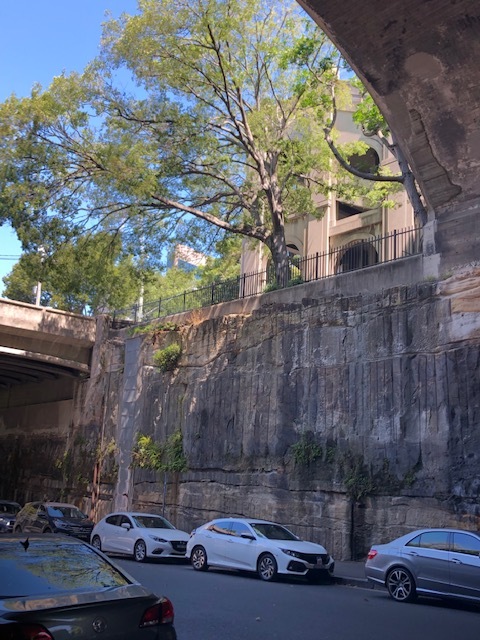 The Argyle Cut was built between 1843 and 1868 using convict labor to drill, dynamite and cut through the sandstone, linking The Rocks and Miller Point. It is now heritage listed. 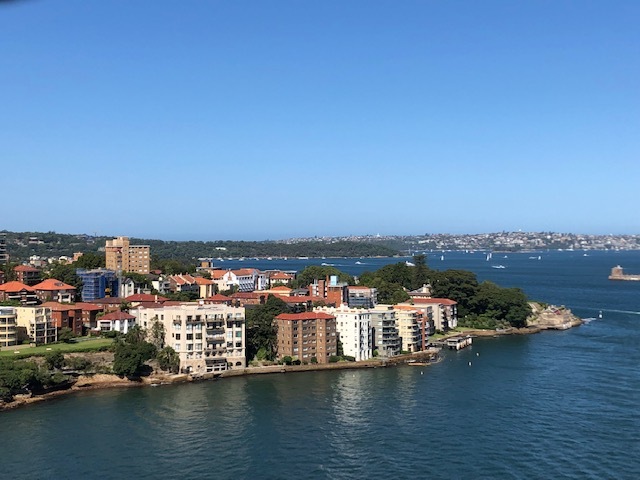 We met Lucinda at Circular Quay, and started our visit with a walk along the Cahill Expressway, on a path that looked out to the harbor and out over The Rocks neighborhood. 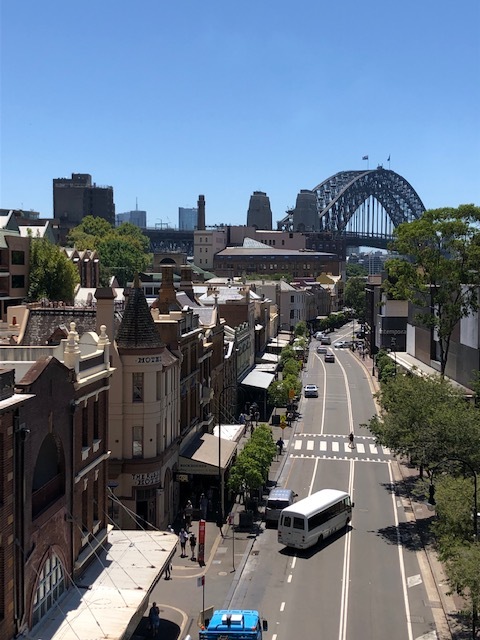 She showed us little paths and stairs that descended into the neighborhood, and we walked around for a bit while Lucinda explained what we were seeing and how places were in the past as well as how they fit into Sydney today. 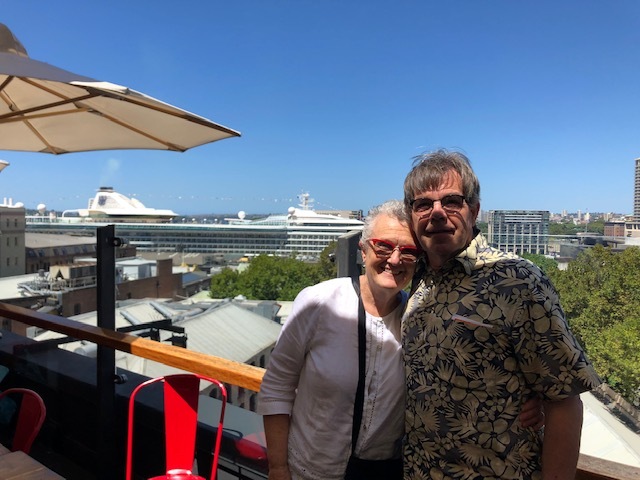 We eventually found our way to the Glenmore pub (in the former Glenmore Hotel) where we enjoyed lunch up on the rooftop, shaded by large umbrellas and cooled by a lovely breeze. It was quite a hot day, in the mid- to upper-80s, and while Brett and Lucinda each enjoyed a couple of beers, I decided to go with a couple of glasses of tasty Australian white wine. Let’s just say I was a bit sloshed by the time we finished – the wine glasses were big, and the pours generous. At the halfway point across. 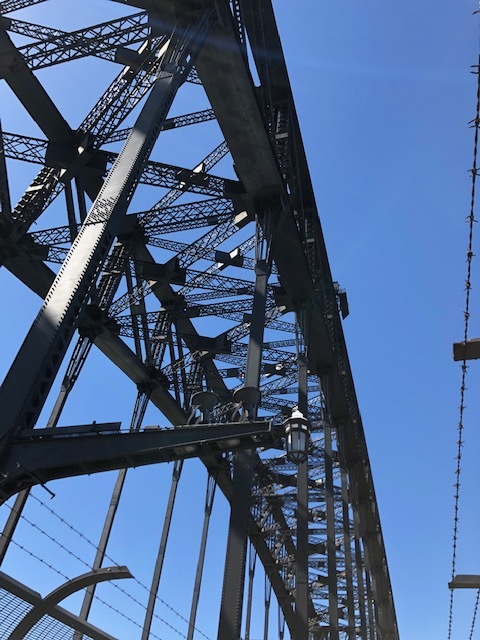 It may have been the remainders of the wine talking, but I felt when I was up there that I maybe could have handled the bridge climb, acrophobia or no. Looking out over busy Sydney Harbor. Other than the ferries, all the boats are recreational. I eventually got myself righted and we headed over to the Harbor Bridge. 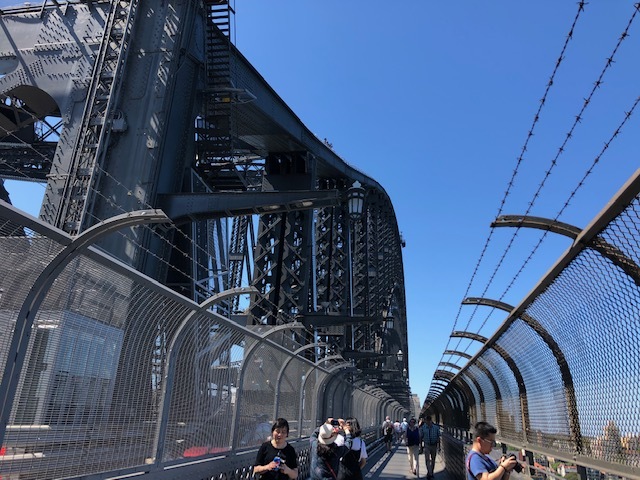 There are stairs to climb up to the bridge, but these days there are elevators as well, so we took one of those and started off across the bridge – the pedestrian path is on the side that faces the Opera House. 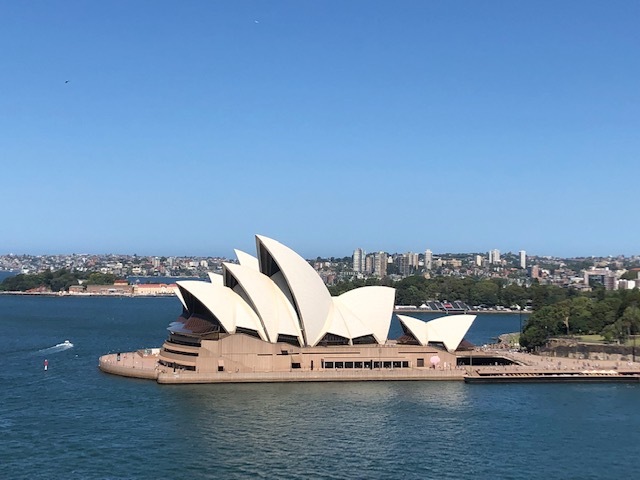 The views along the way were nothing short of spectacular – poor Brett and Lucinda had to stop every few feet so that I could look out and snap a picture of the changing view of the Opera House as well as the views across the harbor. It was especially lovely up on the bridge because of the cool breeze that blew the entire time and kept us cool. 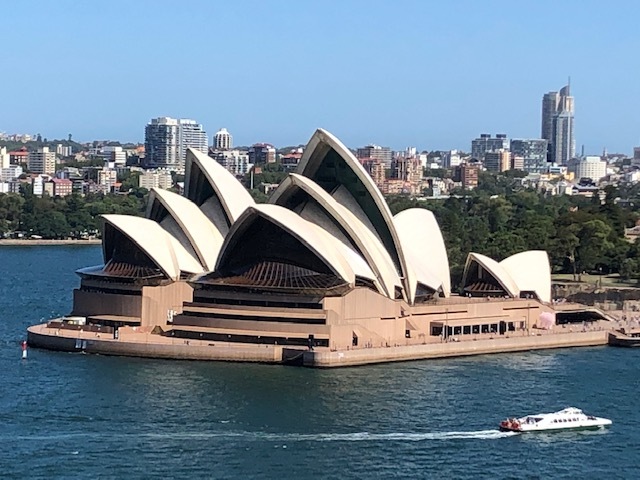 The view of the Opera House changed as we walked across. This was the view, the backside, as we began our walk into The Rocks. As we walked along the bridge, the front began to appear . . .
. . . until finally the entire front was revealed. When we got to the other side we stopped for some gelato, and then it was time to say our goodbyes. Brett and I hopped on our train back to the south side of Sydney and home while Lucinda headed in the other directions. Brett and I agree yesterday was one of the best days we have enjoyed during our travels because it had it all: good weather, an interesting location, history and local color, good food and drink, and best of all, delightful company and wonderful conversation. We only hope that some day in the future we can return the favor and show Lucinda around one of our favorite neighborhoods or cities. Were the workers forced out of their homes by high taxes or were they in rental properties? Love, love, love the history of a place. It was so great to have a local to explain everything. Really enjoying all the pictures. It confirms my intent to visit Australia some day. All property down near the harbor is in high demand, and if I remember Lucinda correctly there were rumblings that the “wharfies” were living subsidized housing in a prime location when it should be going to those who could afford to pay market rate, so yes, they were forced out of their homes and were moved out west of the city. I loved hearing the history of the area – it was one of the things that made the day so special. We’ve really enjoyed our time in Australia – I know you would too. Yes, the housing was state-owned, like what the British call council housing. The govt stopped renting out those properties that became vacant (eg when the resident died or moved into care) and evicted other residents. Offered them state housing in other areas the govt believed the poor and retired workers deserve to live, now that The Rocks is much in demand for business and the wealthy. Lucinda’s background knowledge of The Rocks neighborhood and her sparkling personality made for an absolutely perfect day! Both Brett and I thoroughly enjoyed ourselves from start to finish! It was a wonderful day! I have found I cannot get enough of the Opera House – it’s even more amazing to see it in it’s setting here, from any distance or angle. I am so happy we came here! Lucinda’s knowledge of the history of The Rocks, and her ability to connect it to what’s going on now is one of the things that made our walkabout so great! LOL – the gelato here has been good, but definitely different than what we got in Italy. It contains more milk fat here, I think, so different mouth feel, but great flavors nonetheless. We’d eat more of it! Drinking white wine in the sun – classic Aussie! I’m jealous you got to meet Lucinda, but glad you had a good day out! I had no idea that Sydney isn’t a “working” harbour any more. 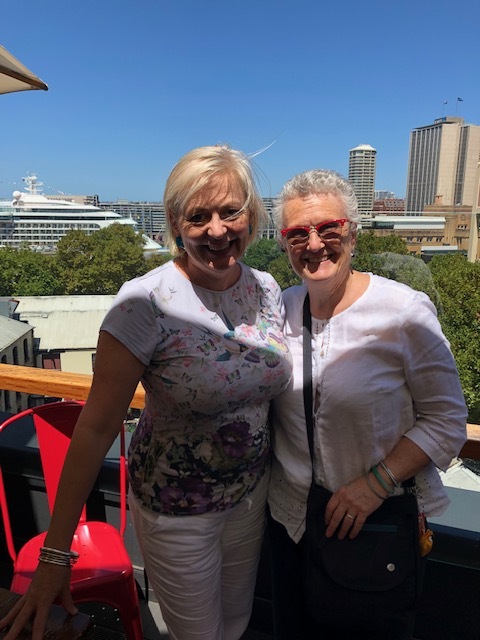 We had such a great day with Lucinda – I am so grateful we were able to meet up in person. 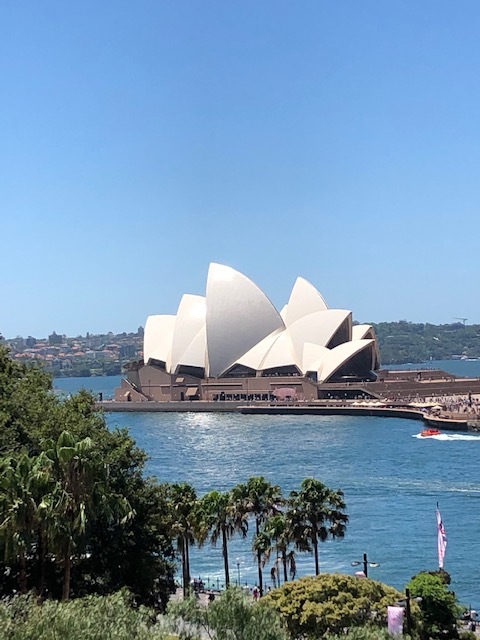 I loved all the wine I tried in Australia, but two big glasses of wine on a HOT, HUMID afternoon was not such a good idea – I got sloshed pretty quickly! We tried several wines on the train – it was all complementary, and all good! I am so glad you enjoyed your day – I did too. It is great to spend the day with like-minded people. It is also great to see one’s city through fresh eyes of the outsider. They were big glasses of wine. Better on hot days to stick with beer with its lower alcohol content. Seriously, it was one of the best days we’ve spent during our travels! Well, all except for the fact that I apparently cannot hold my liquor! In hindsight though I now wish I liked to drink beer.